When your son and husband are in the middle of their treatments for Lyme disease and stage-4 cancer AND your car lease is up, what does one do? My brother offered to fly into New York and go to the dealership with me to help me select my new car, but David said, “No, that’s my job. I’m going to beat this thing, get through my treatments and be in that dealership with you. We’re going to do this together, like we always have.” That same day, I called my financial agency to extend the lease of my car for another three months. The cancer had started at the back of David’s tongue and metastasized out to the lymph nodes on the left side of his neck. Imagine a baseball cut in half and that’s what the protrusion at his collar looked like. The daily treatments of radiation and chemo were brutal. The radiation made the simple act of talking difficult and swallowing was an insurmountable task. With each smoothie I made, it took David several hours to drink only half. Determined not to get a feeding tube, he forced himself to drink what he could, one excruciating swallow at a time. The chemo was just as bad or worse, leaving him feeling miserable and exhausted. At the same time, Mark had endless stomach upset and headaches from months of antibiotics. During this period of agony, there was the sunshiny topic of what car Mom was to get next. My current vehicle was the sensible-type of family car that I had been driving for years. Now, it was the ‘caregiver’ car, as well, driving my boys to their endless doctor appointments. I dreamed of something fun, different and inspiring. Every time I saw a Mini Cooper drive by, my mouth watered. I saw each one as unique and colorful. Some had stripes down the hood while others had detailing down the back. Some were convertible 2-doors while some were sun-roofed 4-doors. All of them were like candy to me. I drooled over them and couldn’t wait to drive one. Mark and I would pour over their brochures and website, ooh-ing and ahh-ing at the 2-door models while David (always Mr. Safety) quietly pointed to the safer 4-door models. In spite of illness, doctors, treatments and procedures, planning my next car was a fun and bright activity for the three of us. There were two big hurdles to jump over before walking through the doors of the Mini Cooper dealership. After three months of antibiotics, one hurdle was to get a thumbs-up from Mark’s Lyme specialist. We breathed a huge sigh of relief when the doctor reported that we caught the disease in time – the medication had worked and Mark was going to be just fine. With one hurdle down we had one to go – David’s surgery. This proved a bit more challenging. The cancerous mass had wrapped around some major nerves (which could affect his speech if damaged) and his carotid artery. This was going to be a very long and delicate procedure. The surgery took 2-1/2 hours longer than predicted, but the brilliant surgeon did it. He not only removed all the remaining cancer, but also saved the nerves and artery from major damage. David was finally cancer free and actually doing quite well! Two weeks later… Mini Cooper, here we come! So, you can only imagine why this day was so special, the three of us walking into that car dealership scoping out the Minis that looked like Matchbox cars, each one just as colorfully tempting as the next. This is the titillating day we’ve been waiting for. 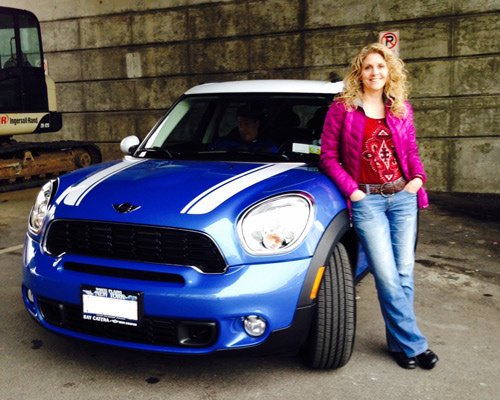 Tough decision, but I ended up choosing a 4-door (yes, Mr. Safety won on that front) blue Mini Cooper Countryman. The color blue symbolizes strength and is also known to have a calming effect on the psyche. It also reminded me of the sky and the sea, so limitless and filled with possibilities for the future. Mark and I dubbed our newest addition to the family “Mini-blue”, our valiant representative of what is possible. It’s hard to imagine that three years have gone by. Both of my guys are doing great and Mini-blue has been a constant reminder of how important it is to have fun, be strong and focus on the benefits that life has to offer. 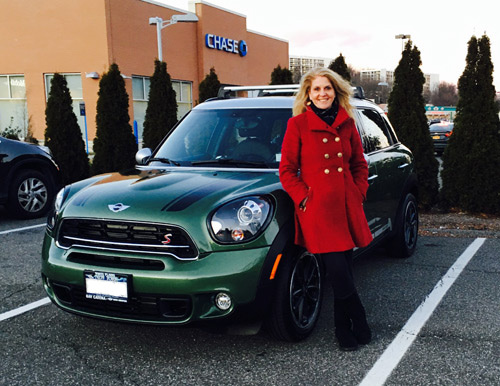 Her lease ends today and I’m picking up my new green Mini Cooper Special Edition Countryman. The color green represents renewal, nature and energy, symbolizing all the best of life. Mark wants to call her Mini-hulk. I’m more partial to Mini-grand. I guess the longest straw will win. I’m not sure what we’ll end up naming her but there’s no question that the three of us have triumphed over illness and a truly difficult period in our lives. Hmmmm… Maybe we should call her Mini-victory? Tamara Green, LCSW, co-founder of Loving Meditations is an author, speaker and trainer Elle Magazine dubs as the Soul-centered Psychotherapist and Meditation Practitioner. When her husband was diagnosed with stage-4 cancer, it was meditation that helped them through their medical ordeal. He is now cancer free, and together, they have created the Loving Meditations App, programs that bring calm to cancer and other serious illnesses for patients, survivors and caregivers. Oh, Tamara. I had no idea that you have been going through all this with your husband and son! I always picture you leading a charmed life with all love and no suffering 😉 But of course life is not like that. I am grateful that things are looking up now and I really love your new Grand Cooper! Thank you Amina. Yes, hope is vital and life is beautiful!! Thank you for your lovely comment Marianne. Blessings to you! Thank you for sharing. Your mini cooper is continuing to help you navigate through those difficult times in life. Hi Stef. You’re absolutely right! Our Mini is definitely helping us to navigate through the difficult times. Thanks for responding.